No toilets, no water, no electricity at the school ! 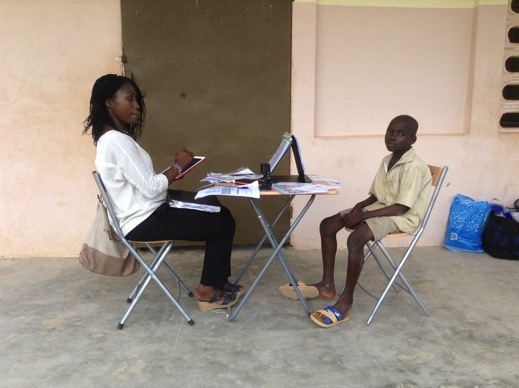 Dr. Clarisse Hager, member of our research team in Côte d’Ivoire, shares her perspectives on field work in rural Côte d’Ivoire. The first day of the field work, as all the team members, I was so excited since it was for me the first time to do such enquiry: from the careful and diligent protocol to the data collection for our research activities. It was a very rewarding experience in terms of research, but also in terms of relationship with the parents (through the COGES), the teachers (though the school Directors) and the students (through the survey). But the living conditions in the visited school was a big challenge for me. I had to deal with the fact that there were no toilets, no water (the Director of the school was saying that the students have to go to his house for them to have some water to drink) and no electricity (so we have to use our phones to have some light at the end of the day to pack up).